Mac Davis', "Baby, Don't Get Hooked on Me"
How could any girl get hooked on a man so arrogant, self-serving and cruel? 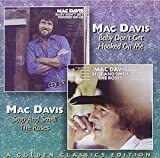 Mac Davis', "It's Hard To Be Humble"
'Cause I get better looking each day. These words are to be expected from the guy who sang "Baby, Don't Get Hooked on Me."